Thanksgiving approacheth and what’s an American in Den Haag to do? Turns out, plenty, but there’s no football involved which is disorienting. It seems that there will be a nondenominational service at a place in Leiden, about ten miles from Den Haag, called Pieterskerk (Peter’s Church), consecrated in 1121. This hasn’t been used regularly as a church in more than a hundred years and the Thanksgiving service is the only service held there each year. There are about 30,000 Americans in The Netherlands and a few of them come to this service which is attended by the American ambassador. There is an American significance to this church. All you American born folks know that the Pilgrims arrived at Plymouth Rock in 1620 and had a grand old time with the folks we used to call Indians but generally refer to now as Native Americans. Everything was so terrific that they had this dinner in 1621 after the harvest which is regarded as the first Thanksgiving. That’s what I always knew along with some other assumptions I didn’t realize I was making. First, I assumed that the Pilgrims came from England. 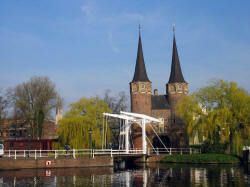 They did originally but when they left England, they went first to Leiden. (I first learned this a few months ago from Mike Levin, an American born in Russia. It’s embarrassing to learn American history from someone born in Russia!) Pieterskerk was their church and the neighborhood around it their home. There is even the Leiden American Pilgrim Museum that has exhibits on their way of life. While reading about the Pilgrims in Leiden, I discovered some other things that were floating around the back of my head that I had never explored. Among the things I learned are that our Native American cousins don’t celebrate Thanksgiving exactly like we do and I’m not talking about the football part. They call Thanksgiving The National Day of Mourning. Sounds pretty ominous. The European settlers were pretty rotten in their treatment of those they found here and gave them a raw deal over then next two centuries. We Americans like to always think of ourselves as the good guys with the white hats spreading freedom and liberty around to everyone and recently, with a direct hotline to the Almighty. Yet with our history of slavery and the Japanese internment during World War II along with the treatment of Native Americans, perhaps we ought to be more aware that the white hat has at least a few smudges of dirt. That same history ought to teach us that there are others, different from us, who also have a legitimate point of view. We discovered after we moved here that a friend from back home has a cousin who lives in Haarlem with her Dutch husband. They have invited us to have Thanksgiving dinner with them and some others on Thursday evening. The owners of this small apartment/hotel where we are staying are a mixed couple. He is Dutch, she is American, from Southern California and then Maine. They are having a Thanksgiving dinner on Saturday right here in this building and have asked us to join them. So Lynn and I wish you all a terrific American Thanksgiving and we hope you get to spend it those you love, if not your families of origin, then certainly your families of choice. And since I mentioned football several times earlier in this message, I’ll want to add only one more thing: How ‘bout them Birds?!?! ?